Nowadays most schools focus more on the theoretical knowledge which a student receives rather than trying to make their students well-rounded individuals. Rather than focusing all their attention on trying to make the students mug up so much of information like machines, students ought to be taught some important life skills which will help them for many years to come. These skills once instilled in a student will never be forgotten no matter how much time goes by. Given here are some important life skills which ought to be taught in school, but which are not. Making conversation is indeed a life skill which is necessary for each one of us. Through the day not only do we need to converse with our family members and friends but we also need to converse with those who we are working with or under. It is indeed rather unfortunate that the art of making conversation is not taught to us in school. Throughout our school lives most often we are told to keep quiet and listen to what the teacher is saying to us and if at all we talk it is only to give a response to a question which is asked. Thinking out of the box is something which is not all that easy. If the school would teach us this vital life skill, it would indeed help us to come up with new and improved ways to deal with problems and situations. In this day and age, companies are on the lookout for those individuals who are able to think out of the box and do their job in an unconventional manner. It is indeed rather sad, that owing to the kind of education we receive, most of us only have theoretical wisdom and are unable to put any of our knowledge into action or to think in a unique manner. Taking care of money is rather tough. Whether we admit it or not, money is something which is required so that we are able to maintain a proper standard of living. If we have less money then affording basic things like food and shelter even become rather tough. A life skill which isn’t taught to us in school is how we ought to take care of our money in an effective manner so that we live a good life now and have enough for our future and old age. It would help us a great deal if we knew how and where to invest our money so that we are able to get high rates of interest. It is sad but true, that through our school days we are encouraged to stick our head in our books and not bother ourselves with any kind of relationships. In the course of our lives, we forge a number of meaningful relations with various people. These people include our family members, office friends, as well as our old school and college friends. A life skill which we ought to learn is that of how to maintain inter personal relationships. Later on in life, many people find it tough to maintain relationships and they even have commitment issues. At such a time, trying to mend the ways of the person becomes impossible. Household repair work is something which all of us have to do at some point of time or the other. It is not practical at all to keep calling in a repair man simply when a light bulb needs to be changed or when a hinges of a door have become loose. This is one life skill which is absolutely essential and which one cannot survive without. It would indeed be ideal if we learnt from our school days how to do repair work around the house. Knowing how to do these things on your own really saves you a lot of money and enables one to be very self sufficient. Not all of us can go through our lives enjoying the wonderful home cooked meals of our mother and neither is it possible to go through life continuously eating junk food from the nearest take away restaurant. Cooking is something which is a life skill which all of us need in order to live a self sufficient life. If you are unable to cook, you are always at the mercy of someone else to give you a meal. Those who are interested in cooking and baking find a way to learn this life skill on their own, but there are others who would have loved to be taught it in school so that they need not spend time at a later period trying to pick it up. As we grow up we realize that taking public transport is neither very cheap nor convenient. It is always a better option to have your own vehicle so that you can do things your own way and not be at the mercy of anyone else. Knowing how to fix your own car or bike when it refuses to start is knowledge which is beneficial to anyone who owns a car. This is a life skill which should have been taught in school so that we do not need to call in a mechanic for every small little job that we can actually do on our own. Needlework is something which is an art. It is not something which you can pick up in a matter of a few minutes. It requires skill and even plenty of practice. At some point of time or the other, all of us have had to sew on a button which came off or even stitch up a hem which has come down. It would indeed be so much simpler if we had learnt to master this life skill in school so that we might have been able to work a sewing machine with ease. Needlework is not merely a life skill but it is also something which can help as a wonderful stress buster. It is rather sad that in schools nowadays all the teachers are busy trying to finish their syllabus and they do not even bother to teach the students how to behave. It is indeed hard to find individuals who have good manners these days. This is indeed a life skill, which is very important in order to create a good impression in the minds of those who we meet. In the present education system there should be less focus on bookish things and there should be some stress put on things like good manners, so that the children grow up to become responsible and level headed adults. All of us dream of growing up, having good jobs and living a happy life with our respective family members. However it is indeed funny that none of us can anticipate just how tough it would be to do your taxes. Taxes are something every citizen of a country is entitled to pay. It is something which we cannot escape from, no matter how much we would like to. Doing your taxes is indeed a life skill, which at some point in time or the other we all need to learn how to do. Those who are unable to file their returns and do their taxes on their own are forced to seek the services of an skilled professional. It is a well known fact that when you go for any social function it is expected that you dress as per the occasion. Though this is a life skill which we are not taught in school, yet we are just expected to know it. It is embarrassing when a person walks in for a program looking either over dressed or under dressed. It would indeed be wonderful if it was taught to us in school how to dress for different occasions. Even simple tips would really help us a great deal in order to look good and feel confident at all such events. Our parents do their level best to educate us, with the aim in mind that we will one day be able to bag good jobs and stand on our own feet. Our schools teach us subjects but they do not teach us how to apply for jobs in a proper manner. Finding a job is not an easy thing at all and it would do the students a world of good if they knew how to go about the entire process. One cannot simply walk into a company and ask for a job. There is specific protocol which needs to be followed. If you drop your resume at the reception, it is bound to be tossed into the trash can in a matter of a few hours itself. Owing to the fact that Environmental Education is a subject which is being given a great deal of importance nowadays, people are becoming more and more aware of the fact that they ought to recycle old material so as to save the planet. Sustainable development and the phrase ‘reduce, reuse and recycle’ are things which we are all familiar. Though we know the definitions of all these terms, we weren’t taught in school, how we ought to put these into practice. Believe it or not, recycling is indeed a life skill which everyone has to acquaint themselves with at some point or the other. As we move on from one class to the next, there is always more and more pressure. It is rather unfortunate that students are just made to tend to this pressure on their own and they are not taught how to deal with it in an effective manner. This is a life skill which not only keeps one positive but it keeps one alive as well. It is shocking to note the amount of suicides which are taking place owing to the fact that people are unable to deal with the stress and problems which life has to offer them. Time management is a life skill which is very difficult to master. 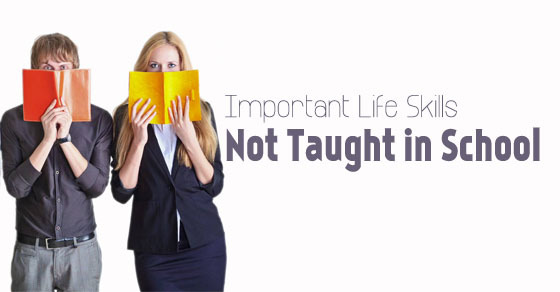 It is a life skill which is very important indeed, but it is not taught in school. In school everyone is responsible for their own actions and if the work is not done on time he or she is simply punished. Rather than this negative enforcement students should be taught from a young age how they ought to manage their time. Giving first aid is something which mostly students who are in a medical stream are taught. Nonetheless it is a life skill which ought to be taught to all students, so that in time of emergency they can put this knowledge into use and may save a life. In addition to this, they should be encouraged to keep a well furnished first aid kit at home at all times. Education is something which we cannot survive without nowadays. Educational qualifications are mandatory in order to back one up. Yet it is often noticed that people who have the highest of qualifications are unable to bag good jobs, simply because such individuals are lacking in life skills. Having these life skills not only makes our lives much easier but they also make our lives happier and more complete. Man is after all a social animal who cannot survive alone, so that is why such vital life skills should be taught in school itself.